Northeast Ohio rarely experienced earthquakes until a cluster of seismic events shook the Youngstown area in 2011. Most of the earthquakes were small, magnitude 2.7 or lower, but a 4.0 tremor on New Year’s Eve was felt from Pennsylvania to Ontario, Canada. While there was no major damage, the tremors left many wondering why phenomena more apropos to Southern California were repeatedly shaking this small city halfway between Cleveland and Pittsburgh. Geologists determined the tremors were not natural but were induced seismicity, triggered by human activities, in this case, by injection well disposal of wastewater from oil and gas operations in the Marcellus Shale. Today, a team of Southwest Research Institute geologists is looking to the Youngstown experience to help them predict how fluid moving through rock pathways may cause inactive geologic faults to slip, causing earthquakes. Based on the Ohio data, they have conducted an internally funded study to gather real-time data on geologic processes at a South Texas wastewater injection well that is part of a water desalination program. This integration of historical and current data will help them better understand how wastewater injection can awaken seismically slumbering regions. Induced seismicity refers to earthquakes and tremors caused by human activity that affect stresses and strains in the Earth’s crust. While most induced seismicity has been of low magnitude, the incidence of stronger events increased dramatically nationwide between 2008 and 2015. The increase corresponds with a boom in onshore, primarily unconventional, oil and gas production, which produces wastewater laced with salts and hydrocarbons. According to the U.S. Geological Survey, the majority of induced earthquakes are associated with wastewater injection in deep disposal wells, although petroleum extraction and hydraulic fracturing themselves are also risk factors. The USGS report shows that less than 1 percent of the 150,000 U.S. injection wells are associated with induced earthquakes, and these events typically occur in oil- and gas-producing states such as Colorado, New Mexico, Oklahoma and Texas. Last year, the USGS published the first induced seismicity forecasts and maps based on historical activity and fault data. Based on the new findings, state agencies are starting to regulate wastewater disposal near known faults. Meanwhile, communities in the affected areas brace for a new wave of seismicity as an uptick in oil and gas prices leads to increased production and corresponding wastewater disposal. SwRI has studied earthquake risks posed by faults within the Earth’s crust for more than 25 years. SwRI’s Center for Nuclear Waste Regulatory Analyses (CNWRA®) initially developed 3DStress® software to support licensing of the Yucca Mountain Nuclear Waste Repository, a proposed deep geological disposal facility for high-level radioactive waste. 3DStress is a user-friendly, interactive tool to investigate geologic stress states and effects on developing and reactivating faults and fractures in crustal rock. The software was expanded to support the energy industry — oil, gas and geothermal — to understand how faults and fractures transmit fluid, which can impact drilling and production. The latest version, 3DStress 5.1, can simulate pressure changes in fluid-filled pores and natural voids in rock and sediment layers. The simulations indicate what’s happening in deep wells used to inject fluids into, or extract fluids from, the Earth. SwRI geoscientists are working with the Bureau of Economic Geology’s Texas-based seismic monitoring network and the Center for Integrated Seismicity Research (TexNet-CISR) program at the University of Texas at Austin to investigate the incidence of induced seismicity. Part of TexNet-CISR’s mission is to install a Texas-wide network of seismometers — the TexNet Seismic Network — to understand both natural and human-induced earthquakes in the Lone Star State. Meanwhile, the injection well monitoring project in South Texas uses the Institute-developed 3DStress modeling software to predict future fault movement associated with the disposal of brackish wastewater from desalination activities. SwRI is using local geological and hydrological data to map three-dimensional fault networks. The data will improve predictive models based on background stress, fluid pressure in pores and water pathways within underground rock formations. 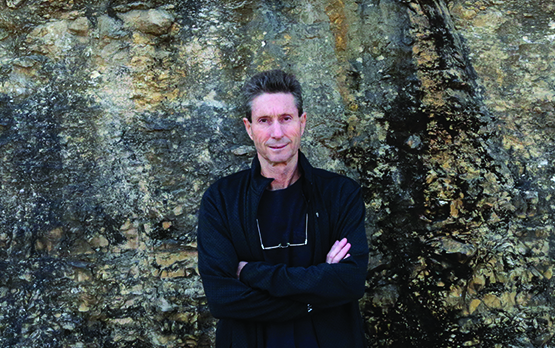 Alan Morris, Ph.D., a structural geologist specializing in quantitative analysis of rock deformation, stands in front of a small fault in exposed limestone. He is the originator and coauthor of 3DStress®, an award-winning software program that interactively analyzes stresses acting on faults and fractures and assesses what could cause them to slip or open. This inset map shows the location of the Northstar #1 injection well in Youngstown, Ohio, near the Pennsylvania border. Wastewater disposal in the well triggered a series of earthquakes in 2011, including a 4.0 magnitude event on New Year’s Eve that was felt as far away as Canada. At right, SwRI used its 3DStress software to evaluate earthquakes triggered by wastewater disposal in the Northstar well. Seismic events are shown in the well and fault zone (boxed) from January to December 2011, colored from the oldest in blue to the youngest in red. 3DStress analysis indicated the high fault slip tendency just prior to the magnitude 4 earthquake. By applying 3DStress to data from the Youngstown earthquake sequence, SwRI geoscientists found that relatively small increases in pore fluid pressure can induce seismicity. Left undisturbed, the fluids that occupy pore spaces in soil or rock typically serve to mitigate stress on bedrock. However, disturbances in pore pressure, such as when fluids are injected or extracted from the formation, can be destabilizing. In the case of Youngstown, a previously unidentified fault poised for reactivation was near an injection well. The hidden fault provided pathways for injected fluids to move around otherwise impermeable rock. The fluids penetrated the fault zone and raised pore pressures, causing it to slip. Three key ingredients control induced seismicity: the presence of one or more faults capable of slipping and producing an earthquake, a state of background stress capable of being perturbed by pore fluid pressure, and enough pressure change to cause the fault or faults to slip. DETAIL The Earth’s outer layer or crust extends about 22 miles deep under the continents and 6 miles deep under the oceans. It’s composed of various igneous, metamorphic and sedimentary rocks. Faults are fractures within Earth’s crust where rock layers on either side of the crack have slid past each other. Some cracks are minuscule and stable or with barely noticeable movement. Others, like the San Andreas Fault in California, are hundreds of miles long and prone to slippage and earthquakes. A fault is a crack within the Earth’s crust that disrupts the layering of geologic formations. Faults often allow fluids to move between formations. The largest faults are typically associated with, or form the boundaries between, Earth’s tectonic plates. In an active fault zone, portions of formations along the fault move or slip against each other periodically. Inactive faults are stable. The magnitude of an earthquake is related to the energy released when a fault slips. This energy is related to the amount of slip and the size of the fault-slip area. In general, the bigger the fault, the bigger the earthquake potential. Faults slip in response to imposed stress conditions, but they have to be in certain orientations with respect to the stress field for that to occur. A key capability of 3DStress is characterizing the relationship between faults and the stress state acting on them to determine slip risks under various conditions and orientations. For example, an increase in pore fluid pressure from dam construction and reservoir filling, waste fluid injection, geo- thermal pumping, and hydraulic fracturing can increase the likelihood of a fault slipping. Knowledge of a link between high pore fluid pressure and earthquakes resulting from human activity dates from the 1930s. Since 1947, the oil and gas industry has used elevated pore fluid pressure to induce failure as the basis for hydraulic fracturing. A strong case for tying artificial increases in pore fluid pressure to induced seismicity was made in the 1960s and 1970s when waste fluid injected at the Rocky Mountain Arsenal induced earthquakes. Controlled water injection experiments in the Rangely oil field in Colorado also demonstrated a relationship between fluid injection and earthquakes. A well-established, but essentially backward-looking, relationship between artificially increased pore fluid pressure and induced seismicity has been seen at dam impoundments and wastewater injection wells. Other instances range from wastewater disposal to geothermal reservoir stimulation and hydraulic fracturing. Much of the Earth’s crust exists in a state of critical or near-critical stress, so relatively small changes in pore fluid pressure can induce fault slip and potentially cause an earthquake. While scientific studies indicate that pore fluid pressure in the Earth’s crustal rock plays an important role in rock deformation, faulting and earthquake processes, conventional pore pressure modeling assumes rock is “isotropic” with physical properties, such as permeability, that do not depend on their orientation. However, most rocks are anisotropic, meaning their properties vary depending on orientation. For example, an isotropic rock layer that is impermeable to fluid penetration from above and below would also be impermeable from horizontal penetration. However, anisotropic rock might be impermeable to vertical penetration but allow fluid entering the layer through a fault to move horizontally through it. Conventional models have proven insufficient to explain diverse phenomena related to pore pressure variation, such as fluid-extraction-induced seismicity. Pore fluid pressure in anisotropic rock not only affects the rock’s effective strength but also causes variations in shear stress. These variations induced by a buildup or a decline in pore pressure can lead to fault instability and trigger earthquakes. Reactivation of a dormant fault is more likely when water is introduced into wells drilled in less permeable rock. These conditions amplify pore fluid pressure changes, increasing the potential for fault reactivation as the pressurized fluid forces the fault apart to effectively unlock the fault and ease slippage. Locating injection wells far from fault zones is the most effective long-term mitigation strategy. Limiting injection periods or reducing injection pressure near faults may postpone seismicity or reduce its magnitude but will not eliminate it. 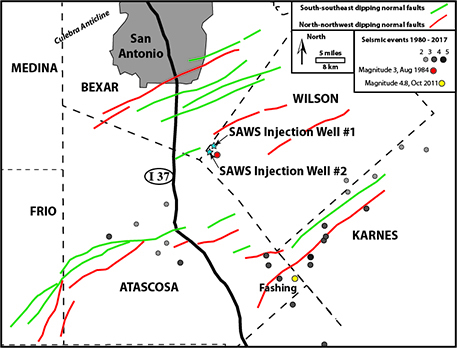 Using 3DStress, SwRI scientists simulated 10 years of injecting wastewater into two wells south of San Antonio and predicted that those activities will cause pressure differences. While the changes are small, they could affect the slip tendency of faults in the area. The top of the sedimentary rock “basement” is colored by change in pressure generated by the injection wells (warm colors indicate higher pressure increase), and the fault is colored by increase in likelihood of slip resulting from increased fluid pressure (again, warmer colors indicate greater likelihood of slip). Two disposal wells south of San Antonio (blue stars) are shown with the principal mapped faults and earthquake epicenters from the period 1980 to present. To study wastewater injection wells and seismicity in real time, SwRI is monitoring wastewater disposal from a nearby desalination plant. In 2016, a San Antonio water utility started purifying water at a facility south of San Antonio to supplement the local water supply. The project extracts brackish water from the Carrizo Formation at about 1,500 feet below ground level and passes the water through a reverse-osmosis treatment plant to remove dissolved solids. Waste product in the form of saline brine is injected into disposal wells at depths greater than 4,000 feet. The disposal wells are close to known or suspected faults and the general area has experienced earthquakes in the past, including a magnitude 3 earthquake in 1984 and a magnitude 4.8 earthquake in 2011. The geological characteristics of the saline brine disposal wells are well known, and injection rates for these wells are being monitored with extremely high precision. SwRI is taking advantage of this combination of circumstances to study the relationship between injection and seismicity in the surrounding area. Several factors suggest that injection well activities potentially could induce seismicity in this region. First, the area has experienced measurable earthquakes in the past 35 years, indicating the presence of earthquake-capable faults. Second, known and suspected faults in the area have orientations favorable for slip in the current, ambient stress state. Third, 3DStress analysis indicates that the rate and total volume of injected water after six months of operation — 4.9 million barrels — would be enough to generate a seismic event greater than 4.0 magnitude if an appropriate fault were present. Finally, waste injection is projected to continue for the next 30 years, eventually using as many as five active injection wells. Although the risk of earthquakes induced by these wells may be low, it is not zero. However, the risk can’t be easily quantified using the known data. The SwRI team’s internally funded study was a two-pronged approach toward monitoring and understanding the ongoing injection program, sowing the seeds for future work. The SwRI geologists integrated high-resolution injection monitoring with existing geologic information in the 3DStress program to model potential future scenarios of stress states and fault reactivation in the vicinity. The resulting models have predicted only a modest increase in pore fluid pressure over the lifetime of the injections. However, even small increases could destabilize nearby, critically stressed faults. So far, forecasting potential earthquakes is hampered by two significant sources of uncertainty: the exact nature of the underground fluid flow paths that determine where injected water will go, and the local ambient stress state. DETAIL Desalination is a process that extracts salts and mineral components from saline water to produce water suitable for human consumption or irrigation. Along with recycled wastewater, it is one of the few rainfall-independent water sources. The models will be updated as additional injection data are gathered, and the simulation scenarios will be modified accordingly. As the injection program proceeds, a key element in monitoring the injection wells will be the near-real-time acquisition of seismic data, providing the exact time and location of earthquakes. The TexNet-CISR Seismic Network is monitoring dozens of seismometers across the state of Texas, which has more than 50,000 permitted disposal wells. 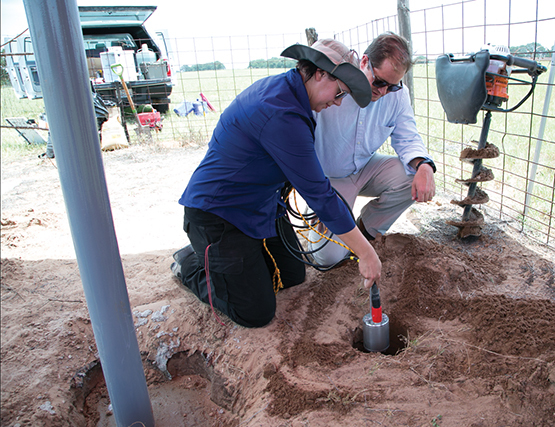 Through collaboration between TexNet-CISR staff, local groundwater conservation districts, landowners and SwRI, a seismometer was installed close to the disposal site to provide high-quality data relating to earthquakes in that area. SwRI is planning to install several additional seismometers in the surrounding area to improve fidelity of earthquake detection and precision of earthquake positioning in the area. The predictions made by the 3DStress scenario analysis will be tested against actual earthquake activity recorded by this seismometer network, with the results folded back into the model to improve its predictive capability. Also, any seismic activity will spotlight areas where faults and fractures are being reactivated, adding valuable information on fluid pathways and other geological features to calibrate and improve the predictive models. The progression of earthquakes, if any occur, would provide an early warning to local residents if event magnitudes reach levels that might be of concern. Through collaboration between TexNet-CISR staff, local groundwater conservation districts, landowners and SwRI, a seismometer was installed close to a wastewater disposal site to provide high-quality data relating to earthquakes in that area. 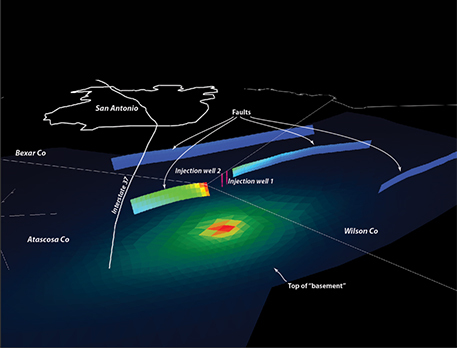 SwRI geologists are studying the real-time relationship between the ongoing injection program south of San Antonio and seismic activity. Induced seismicity associated with wastewater injection wells is something of a hot topic. Extensive uncertainty remains about exactly how it is caused and how to mitigate its effects. One key data gap involves a lack of detailed seismic monitoring of the injection site geology. The installation of a high-quality seismometer in the vicinity of the injection site will allow improved seismic data collection and a more complete understanding of fluid movement pathways in the subsurface. Plans are currently in place for SwRI to install a local seismometer network south of San Antonio to help close this data gap. Adding these data to SwRI’s 3DStress software could help geologists understand and mitigate induced seismicity associated with energy production as well as desalination activities. Questions about this article? Contact Morris at +1 210 522 6743. 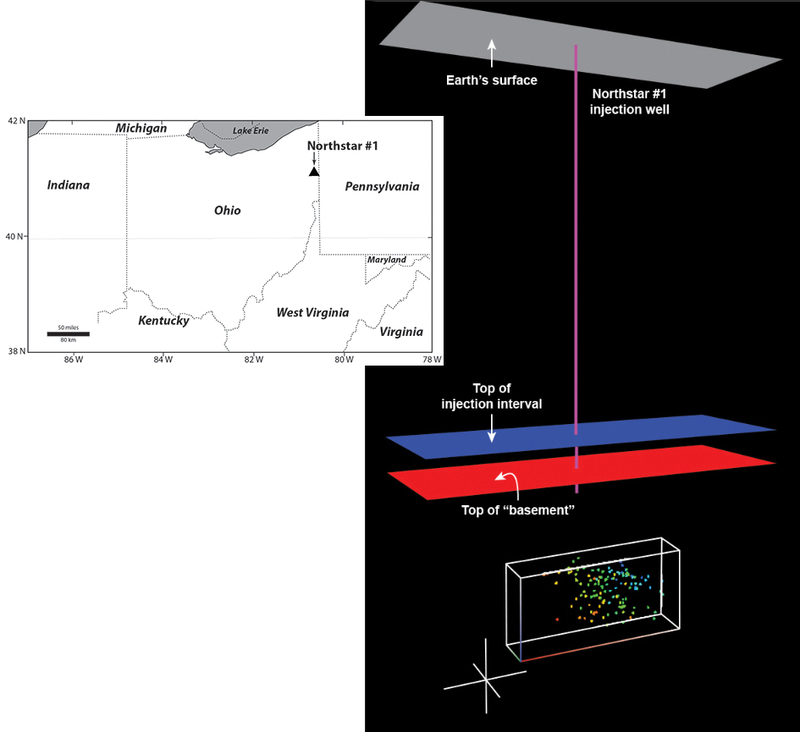 Some of the figures were originally published in the paper “Lessons learned from the Youngstown, Ohio, induced earthquake sequence January 2011 to January 2012,” in the November 2017 issue of the Journal of Rock Mechanics and Geotechnical Engineering by Dr. Alan Morris, Dr. David Ferrill, Dr. Gary Walter, Aaron Price, Dr. Kevin Smart (all of SwRI), Dr. Robert Skoumal (United States Geological Survey), Dr. Mike Brudzinski and Dr. Brian Currie (both of Miami University, Oxford, Ohio). The author also thanks SwRI’s Ron McGinnis and Nate Toll for their assistance with this project.